The TurboPower™ 15 wall charger delivers hours of power in just minutes of charging. * It includes a micro-USB charging cable. You can use the charger on compatible smartphones, tablets, digital cameras and more. • Charge fast. Over and over. 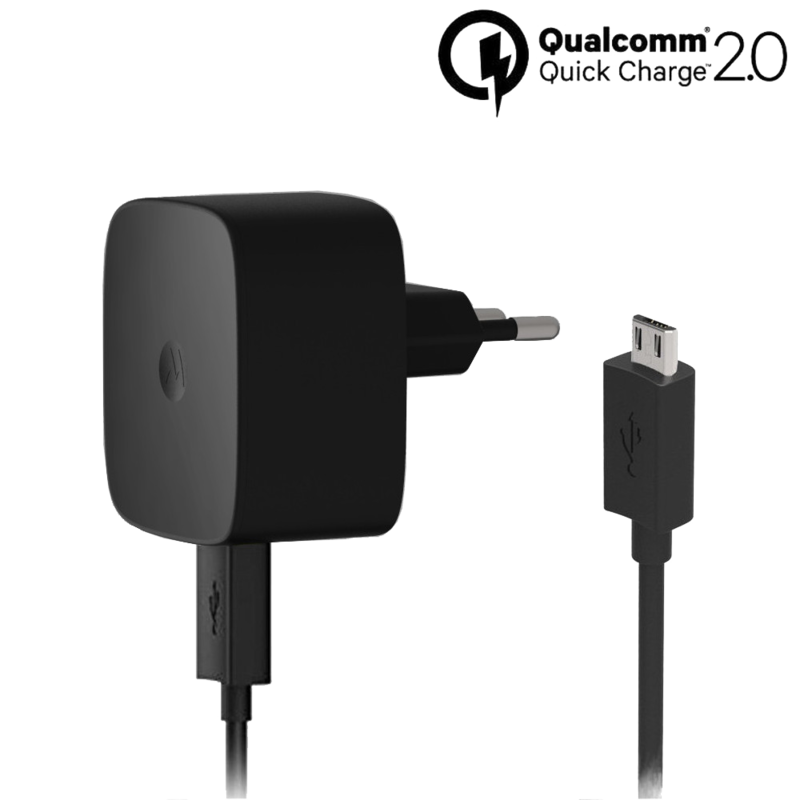 Turbo charge your smartphones and tablets without decreasing your battery’s lifespan thanks to the optimized battery charging algorithm and Qualcomm QuickCharge 2.0 technology. • One for all. Charge any single USB or micro USB enabled device. TurboPower™ supports a wide range of profiles that can take advantage of blazing-fast charging speeds. • Charge safely. Rest easy. Get built-in protection from power surges, extreme heat, and other dangers, and know your smartphone or tablet will remain safe while charging. • High Energy Efficiency. Part number SPN5866A (EAN: 6955226406744) with High Energy Efficiency Level VI. • Includes 1-meter a detachable micro-USB charging cable. You can use it with compatible smartphones, tablets, digital cameras and more. Motorola Droid Turbo, Turbo 2, Ultra, Moto G4, Moto G4 Plus, Moto X, Moto X Play, Nexus 6 as well as compatible micro USB enabled smartphones, tablets, digital cameras, and other devices. Standard is 5 volts at 1.6 amps. Turbo 1 is 9v at 1.6 amps. Turbo 2 is 12v at 1.2 amps. The turbo outputs are controlled by the Qualcomm Quick Charge 2.0 interface, and the charger will not enter those modes unless connected to a compatible device. Yes. Once the device is charged to 100%, it will enter standby mode. To use this charger with the Moto Z, you need a USB to USB-C cable. The charger itself is capable of powering the Moto Z family, but this version ships with a micro-USB cable, so it will not work out of box for the Moto Z. It works, but will not turbo charge because the Moto E does not have the turbo capability.